LAST FRIDAY WAS supposed to be ‘Brexit day’. But as with everything in the long-running Brexit saga, it wasn’t that simple. Instead, the United Kingdom and European Union agreed a flexible Brexit extension until 31 October following marathon talks in Brussels. It was a move that, curiously, didn’t feel as urgent as previous decisions with Brexit. Perhaps fatigue was setting in. But a big decision it was – the flextension gives UK Prime Minister Theresa May extra wiggle room to get her Brexit deal over the line. It means that she now has until Halloween to get her MPs to agree to the withdrawal deal. But it also means that the UK might have to start preparing to take part in the European elections. Confused? Want to understand what’s going on? Well our latest episode of The Explainer podcast is for you. In this episode, presenter Sinéad O’Carroll is joined by TheJournal.ie‘s Gráinne Ní Aodha and Christine Bohan as well as executive director of European Movement Ireland Noelle O’Connell to look at exactly what is happening with Brexit now, and what it means for Ireland and the upcoming European elections. Listen via Soundcloud below or tap the buttons to listen on iOS or Android. Find a full list of where the podcast is available here. This episode was put together by presenter Sinéad O’Carroll, executive producer and guest Christine Bohan, producer Aoife Barry, assistant producer/technical operator Nicky Ryan and contributing reporter Gráinne Ní Aodha. Design by Palash Somani. Email “The Explainer: What exactly happened with Brexit last Wednesday night?”. 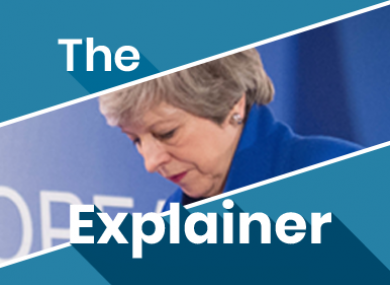 Feedback on “The Explainer: What exactly happened with Brexit last Wednesday night?”.